I’ve always loved airplanes and flying, so I was really looking forward to our stop in St. Maarten. 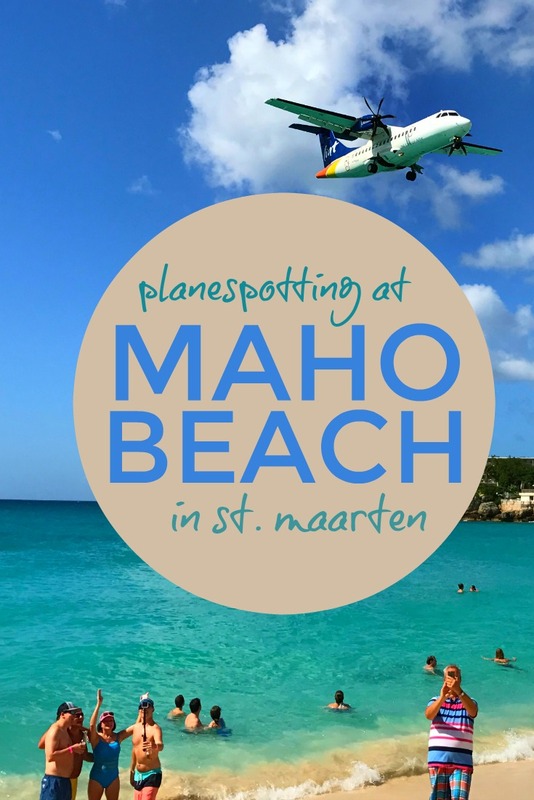 Situated at the end of the runway of St. Maarten’s Airport sits Maho Beach, a wonderful spot to take in some rays and bob in the waters of the Caribbean Sea. It is also a prime spot to watch airplanes as they come in to land on the runway which is located right across a narrow street from the beach. Because of this unique location, you can get an amazingly close view jets landing and taking off. 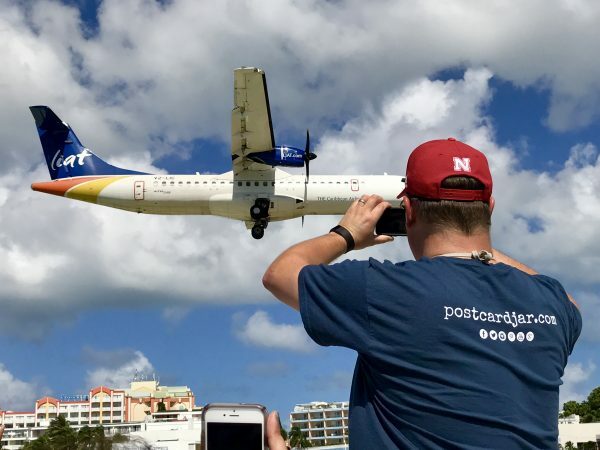 And while many of the planes that land in St. Maarten are small planes that hop around the islands of the Caribbean, there are also some really big planes that arrive from as far away as Paris and Amsterdam. To give you an idea of just how close you are to the runway, as you approach the airport you’ll see this sign: “Danger. 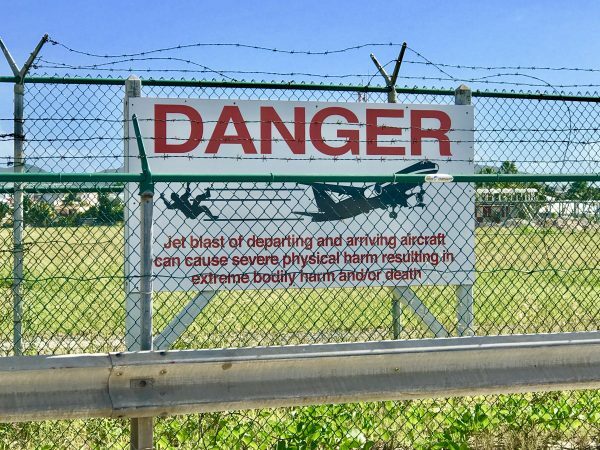 Jet blast of departing and arriving aircraft can cause severe physical harm resulting in extreme bodily harm and/or death.” They aren’t kidding. This sign warned people of the dangers of the aircrafts taking off and landing but people didn’t seem to care. Check out this video taken by someone named PilotDynan who was willing to stand in the jet blast of a departing Air France A340. We don’t have one of those videos nor do we advise standing where he stood! As soon as we confirmed that we were taking this cruise, I started planning our trip to Maho Beach to see the planes. Shortly after our ship docked in St. Maarten, Ann, Meghan and I headed off the ship with a plan of finding our way there. It should be noted here that the day we were in St. Maarten, there were six ships in port, (four of them from Celebrity!) meaning that there were something like 16,000 extra people on the island. 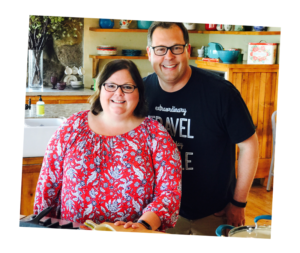 We headed past the visitor’s center and found our way to the crazy-chaotic taxi stand. 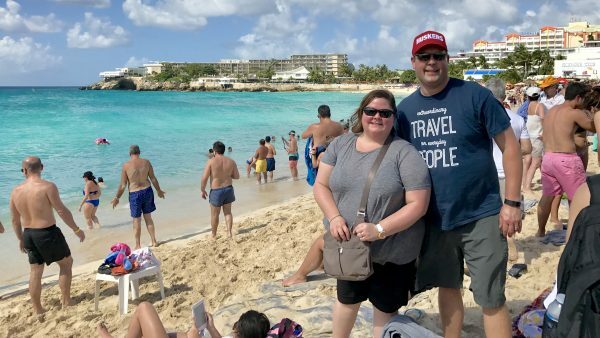 Seeing that the price to Maho beach was $9/person each way but $8/person if you had more than six in your group, we promptly found another family headed the same way and made our way into the “Maho Beach” line at the cab stand. The reality, though, was that the cabs were 15-passenger vans, the lines were more like fiefdoms run by cab stand “managers” who would argue with each other, and they just stuffed people into the cabs from what they perceived to be the front of the line. Apparently, the front of the line was determined by who could weasel themselves closest to the curb. Vans were stuffed until they were overflowing with humanity. 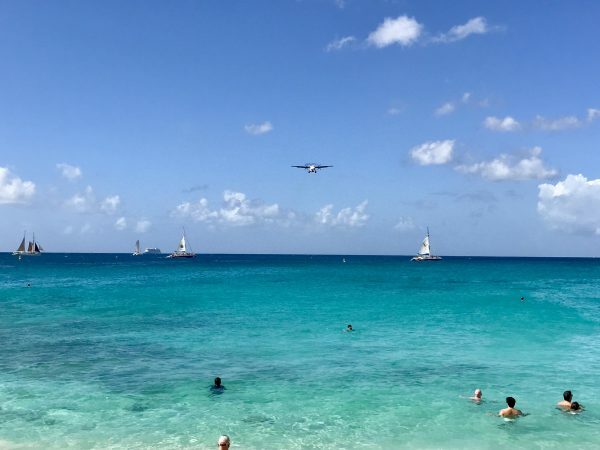 People swimming in the Caribbean Sea would stop every once in a while to watch planes come in the landing just above their heads. As we drove to the beach, I chatted with the driver (as I was wedged-in up front) while Ann and Meghan, crammed in the back, chatted with some folks from England. I learned a lot about the island–it is divided into two halves, the French side and the side belonging to the Netherlands Antilles. There are two official forms of currency there, the Euro and the Netherlands Antilles Guilder, although the reality is that the U.S. dollar is the only one that anyone uses. Finally, due to a treaty signed between the French and Dutch about 350 years ago, people on the island can pass between the two countries and do business anywhere on the island at any time. This was a good idea then as well as now as the island is only 37 square miles and is the smallest land mass in the world to be shared by two countries. We got to Maho Beach, paid the cab fare, and made our way out to a prime spot just to the right of the end of the runway. The beach was remarkably narrow but incredibly packed with people; only about 15-20 feet of sand separated a narrow road from the beautiful blue water. We didn’t get in the ocean at Moho Beach, but we did enjoy soaking in the sun and people watching. On the other side of the narrow road was a fence, and the airport’s runway went right up to that fence. At each end of the beach there was a bar/restaurant to serve the flocks of tourists who came each day for the plane spotting. One of them even had a board with the projected arrival times of the bigger jets. We found a spot to sit on the curb by the road and waited for airplanes. We watched a few small planes land and a few small planes take off. The sun was strong, and we knew we probably didn’t want to sit and wait over an hour for the next bigger plane without having some shade, so we headed to one of the restaurants, stepping carefully to avoid stepping on anyone as virtually every square foot of the beach was covered by someone. We grabbed a bite to eat, watched some folks snorkeling off a boat nearby, and saw several smaller airplanes make their final approaches to the airport. It seems so matter-of-fact as I type it, but it was an amazing, unique place. Where else can you eat a chicken wing while seeing planes close enough on final approach that you can make out the people in the windows? We picked our way out onto the beach in time to watch the arrival of an A320 from the U.S. It was a very cool (and surprisingly loud) experience to be that close to a commercial jet in flight. After that, the next bigger plane wasn’t due for over an hour, so we headed to a nearby gift shop, bought a postcard and t-shirt and then found a cab (with with 12 complete strangers) back to the cruise port. Once back at port, we took a moment to wander around and look at the other ships in port. It isn’t common that one cruise line will have so many of their ships in the same port the same day. On this particular day, Celebrity Cruises hosted a concert by Demi Lovato exclusively for the passengers on their ships. We didn’t go to the concert, but we did sit high up on the back deck of our ship, (Celebrity Summit), and listen to what we could while sipping cocktails. Demi Lovato performed on the stage with the black cover in the center of the this picture. If you visit St. Maarten and Maho Beach, I’d recommend that you know the arrival schedule of the planes you’d like to see. The big planes take off and land more frequently on YouTube than they do in real life. Waiting in between those planes could be a hot proposition in the Caribbean sun, so wear a hat, bring plenty of sunblock, and maybe a bottle of water. Still, it is impressive to be that close to a working runway even if you see only smaller planes. For me, it was an item checked off my bucket list — although if I ever return to St. Maarten I’d go there again. 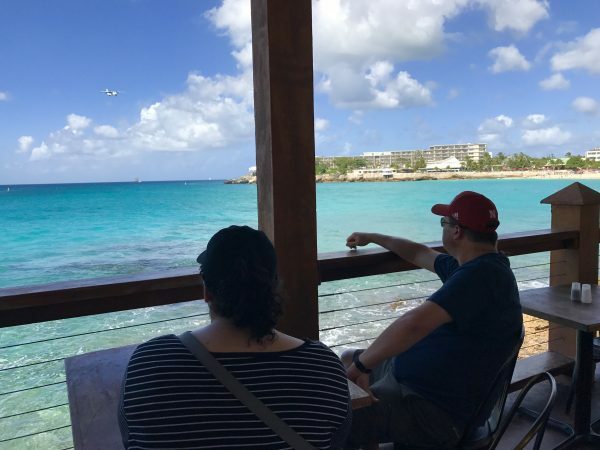 Checked another item off our bucket list when we went to Maho Beach in St. Maarten to watch planes landing just just yards from the beach.